I love, love, love my kids' openness to trying new foods. With a day off from school yesterday due to President's Day, we ventured off to our closest large city for some shopping and lunch. Well, it must have been "taste of the ocean" day at one particular store because there were employees up and down every aisle passing out all kinds of fish and seafood samples. From shrimp to crab cakes to flounder to tilapia to salmon - in every flavor of sauce, breading and seasoning - my kids tried them all (and loved them all). And, of course, they begged to pretty much buy them all. We settled on some fresh tilapia. We decided on using it in fish tacos. 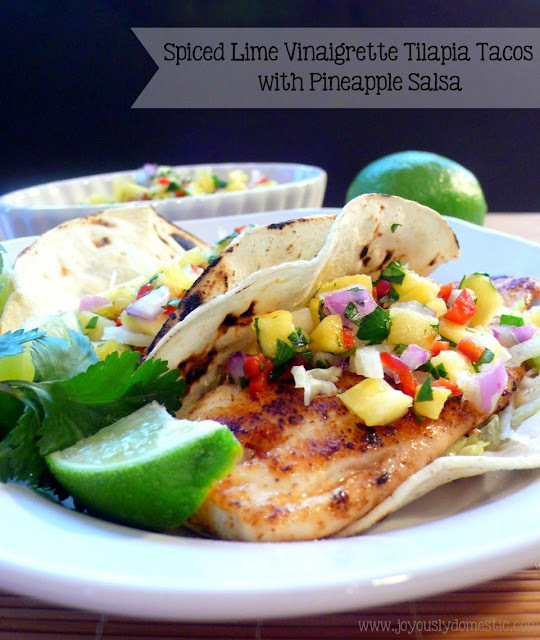 Spiced Lime Vinaigrette Tilapia Tacos with Pineapple Salsa to be exact. I love this recipe and it's actually quite simple to prepare. The vinaigrette for the fish consists of some basic taco-style seasonings, fresh lime juice and a little oil. Once brushed with the vinaigrette and cooked, the fish gets snuggled inside of a warm tortilla and topped with a super healthful, fresh pineapple salsa. Add on a little shredded cabbage and bright, fresh cilantro for the perfect fish taco. Yields 8 tacos (4 servings). NOTE: I cut the fish in half and they were still very large pieces. They could easily be cut into four pieces length-wise, which would allow you more servings. You may desire to double the salsa recipe if doing so, however. And, you would, of course, need additional corn tortillas. Recipe adapted from Cooks & Books & Recipes. These look so yummy, I just pinned them! Hello, Sara. I don't include nutritional information, but I know there are sites that allow you to punch in the ingredients and amounts to find out what you'd be looking at calorie-wise. I'm sorry I couldn't be of much assistance. Thank you for your question. And, I apprecaite your visit.